Daily light curve of the VHE γ-ray emission from BL Lacertae above 200 GeV between June 15 and 28. 2015. Credit: Acciari et al., 2019. Using Major Atmospheric Gamma-ray Imaging Cherenkov (MAGIC) telescopes, an international group of astronomers has detected a fast, very high-energy (VHE) flare from the blazar BL Lacertae. The finding is detailed in a paper published January 7 on the arXiv pre-print repository. Blazars are members of a larger group of active galaxies that host active galactic nuclei (AGN). They are powerful sources of emission across the electromagnetic spectrum from radio to very high-energy gamma frequencies. Their characteristic features are relativistic jets pointed almost exactly toward the Earth. Located some 900 million light years from the Earth, BL Lacertae is the prototype of the BL Lac objects—a type of blazar showcasing lower power jets and higher Doppler factors than other blazars. BL Lacertae is known for its complicated, long-term behavior and previous studies suggested that it shows quasi-periodic variability in optical and high-energy gamma-ray bands. The first detection of VHE gamma-rays from BL Lacertae was made in 1998, and to date, few gamma-ray flares has been observed from this blazar. 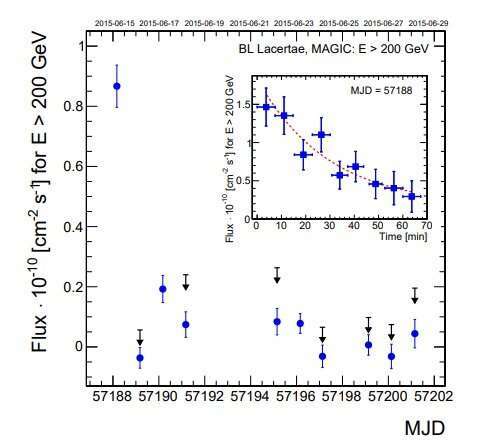 Now, a team of over 100 astronomers led by Victor A. Acciari of the University of La Laguna, Spain, reports the finding of another flare from BL Lacertae, exhibiting fast variability of gamma-ray flux. The new flaring event was detected on June 15, 2015 by the MAGIC system. "The MAGIC telescopes detected a fast very high-energy (VHE, E > 100 GeV) γ-ray flare from BL Lacertae on June 15, 2015. (…) In this paper, we present the MAGIC VHE γ-ray data together with multiwavelength data from radio, optical, X-rays, and HE γ rays from 2015 May 1 to July 31," the researchers wrote in the paper. According to the study, the June 2015 flare had an energy of over 100 GeV, a maximum flux of approximately 1.5 x 10-10 photons/cm2/s and halving time of about 26 minutes. The astronomers added that the multiwavelength behavior of BL Lacertae observed with MAGIC and other telescopes during the three months (May to July 2015) was rather similar to the behavior typically observed in this source during high flux states. The researchers noted that The fast VHE gamma-ray flare was not accompanied by a significant brightening in gamma-ray, X-ray or optical bands. This conclusion is based on the observations of the blazar from the same day in all of these bands. Trying to explain the fast variability of VHE gamma-ray flux in BL Lacertae, the scientists tested three models, but they were unable to choose the most plausible one. "The interaction model is preferred, as it matches the observed repeating multi-wavelength patterns best, but in our simple blob-in-blob model it gives the worst description of the γ-ray band data," the paper reads. Therefore, Acciari and colleagues suggest further observations of BL Lacertae during VHE gamma-ray flares with strictly simultaneous optical and X-ray high cadence data, as well as intense long-term monitoring of this blazar, regardless of its VHE gamma-ray state.